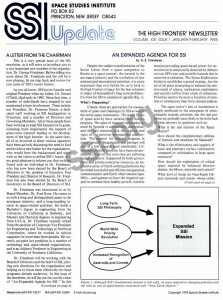 This is a very special issue of the SSI newsletter, as it will serve to introduce you to a very important new member of the organization, Dr. George Friedman. Before telling you more about Dr. Friedman and the roll he is now playing, let me step back and review for you some of SSI’s recent history. As you all know, SSI lost its founder and original President when my father, Dr. Gerard O’Neill, died early in 1992. Since that time, a number of individuals have stepped in and maintained a keen involvement. These include our President, Dr. Freeman Dyson, a dedicated staff working at SSI headquarters in Princeton, and a number of Directors and Governing Members. All of these people have been working to keep SSI focused on its goals, including most importantly the support of grass-roots research leading to the development of the high frontier. At the same time, all of us involved in these various capacities have been actively discussing the need to find and involve a new leader for the organization, who would have the background and share with us the vision to define SSI’s future. It is my great pleasure to inform you that we have found such an individual in Dr. Friedman, who has now been elected by the Board of Directors to the position of Executive Vice President and Director of Research. Dr. Friedman has also been elected by the Board of Governors to the Board of Directors of SSI. Dr. Friedman was introduced to us by Board Member, Dr. Fred Rose. He comes to us with a long and distinguished career in the aerospace industry, and a long-standing interest in space-related activities. He holds a Bachelor’s degree in engineering from the University of California at Berkeley, and Masters and Doctoral degrees in engineering from UCLA. Dr. Friedman recently retired from the position of Corporate Vice President for Engineering and Technology at Northrop Corporation, where he worked in various capacities for more than three decades. He currently occupies key positions in a number of technology and space-related organizations, and is an Adjunct Professor in Engineering at the University of Southern California. Dr. Friedman will be working with the Board of Directors and the Staff of SSI, plotting new directions for the organization and helping us to focus most effectively on those programs already underway. 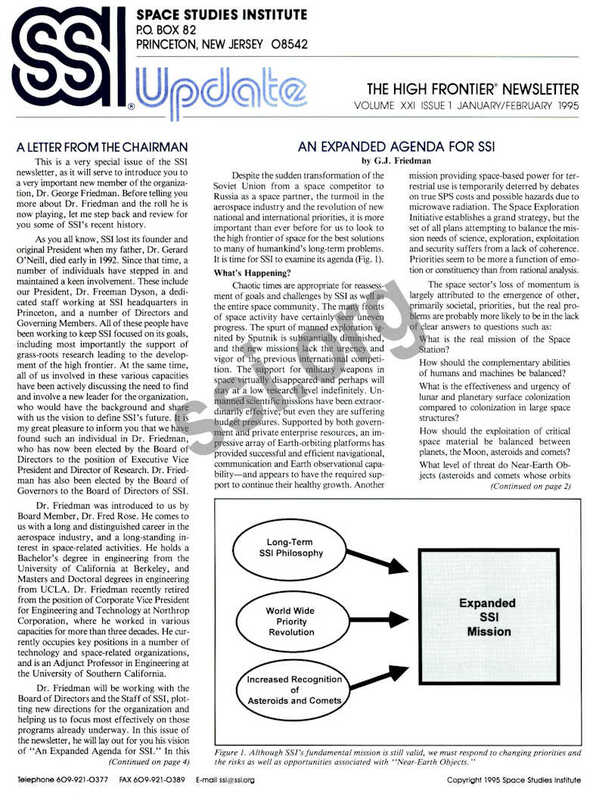 In this issue of the newsletter, he will lay out for you his vision of “An Expanded Agenda for SSI.” In this piece, he clearly describes the changes occurring in recent years that have redefined the political world, and in so doing in many respects redefined how the development of space must be approached in the future. He illustrates not only his commitment to SSI’s founding vision, but also astutely notes how SSI must change in order to adapt to our changing world. New opportunities are described in the area of Near-Earth Objects that not only supply additional justification for SSI’s goal of establishing space settlements, but also provide materials for their construction. In other areas, a number of opportunities are outlined that are not only consistent with objectives described in “The High Frontier,” they also represent next logical steps beyond that founding vision. I am extremely pleased that Dr. Friedman has chosen to join in our efforts. I strongly believe that through his involvement, SSI will be able to build soundly on its very solid base as an effective grass-roots organization significantly impacting the movement of humankind beyond the limits of the Earth. Please join me in welcoming Dr. Friedman to the Organization, and support him in his efforts to guide SSI’s future development. Despite the sudden transformation of the Soviet Union from a space competitor to Russia as a space partner, the turmoil in the aerospace industry and the revolution of new national and international priorities, it is more important than ever before for us to look to the high frontier of space for the best solutions to many of humankind’s long-term problems. It is time for SSI to examine its agenda (Fig. 1). 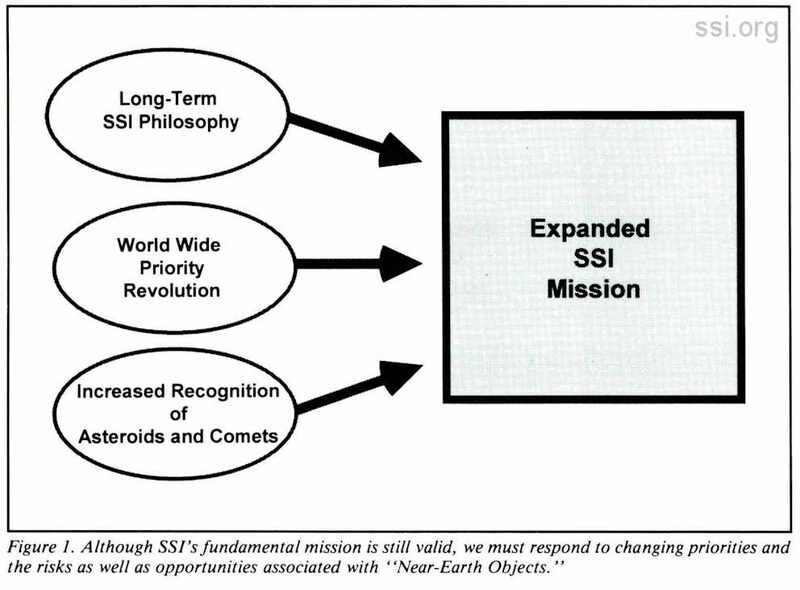 Chaotic times are appropriate for reassessment of goals and challenges by SSI as well as the entire space community. The many fronts of space activity have certainly seen uneven progress. The spurt of manned exploration ignited by Sputnik is substantially diminished, and the new missions lack the urgency and vigor of the previous international competition. The support for military weapons in space virtually disappeared and perhaps will stay at a low research level indefinitely. Unmanned scientific missions have been extraordinarily effective, but even they are suffering budget pressures. Supported by both government and private enterprise resources, an impressive array of Earth-orbiting platforms has provided successful and efficient navigational, communication and Earth observational capability – and appears to have the required support to continue their healthy growth. Another mission providing space-based power for terrestrial use is temporarily deterred by debates on true SPS costs and possible hazards due to microwave radiation. The Space Exploration Initiative establishes a grand strategy, but the set of all plans attempting to balance the mission needs of science, exploration, exploitation and security suffers from a lack of coherence. Priorities seem to be more a function of emotion or constituency than from rational analysis. What is the real mission of the Space Station? How should the complementary abilities of humans and machines be balanced? What is the effectiveness and urgency of lunar and planetary surface colonization compared to colonization in large space structures? How should the exploitation of critical space material be balanced between planets, the Moon, asteroids and comets? What level of threat do Near-Earth Objects (asteroids and comets whose orbits cross the Earth’s orbit) present to terrestrial safety, and what is the appropriate response to this threat? The fundamental insight and idealism of our founder still retains its validity, in my opinion. The concept of colonies in space still appears more justifiable than the colonization of planetary surfaces. Realizing that most terrestrial problems can be solved if sufficient power is available, but that power is generally polluting and eventually limited, then the concept of spaced-based power sources will be increasingly valuable. Satellite navigation and communication systems have already been deployed in vast profusion. Perhaps even more valuable than these specific visionary dimensions was O’Neill’s balanced overview of the many aspects of humanity’s future condition, especially the balance between the desire to learn, explore and be fulfilled on the one hand, and the ability to live within, control and survive the environment on the other. The spirit of these insights are still valuable to contribute to the future directions and coherence of space programs. However, even the most well-founded philosophy must be sensitive to the changing world and new data. Obviously, as summarized above, the world has changed drastically. Regarding new data, virtually every new measurement of disease, pollution, population, poverty, unrest, ozone depletion, global warming, education and generally limited resources has accentuated the concern about the sustainability of the quality of life on this planet. Quite separately, during the past decade a surge of geological, paleontological, and astronomical data have strengthened the conclusion that the human race may be vulnerable to an event that – although it has low probability – is qualitatively more dangerous than anything we have previously experienced or even defined. It may cause the extinction of the human race in the abrupt manner that the dinosaurs and most of Earth’s species perished at the Cretaceous/Tertiary boundary. I clearly remember my pre-1980 perception of the solar system: predictable planetary orbits swept clean of debris through billions of years of collisions, except for a few thousand reasonable well-behaved asteroids mostly in a belt beyond Mars, and a few million comets, mostly in clouds too far beyond Pluto to worry about. Also, I felt comfortable with the general wisdom that the major extinctions in the paleontological record were due to volcanic activity or climactic changes perhaps precipitated by poorly understood solar cycles. The decade of the 1980s revolutionized this point of view, requiring a reassessment of this risk to humanity. At its beginning, the confluence of the findings of the world-wide iridium layer precisely at the geological level representing the end of the age of dinosaurs with the “nuclear winter” mathematical models resulted in the substantiation of a relatively new theory. The Cretaceous/Tertiary boundary was caused by the impact of one or more Near-Earth Objects (NEOs). At the decade’s end, the asteroid 1989 FC passed alarmingly close to Earth, and was first observed on the way out – a classic case of zero warning time! Had it struck a populated area, the immediate and long-term mortality could have exceeded all the casualties in all the wars fought in human history. The American Institute of Aeronautics and Astronautics (AIAA) and others wrote position papers. 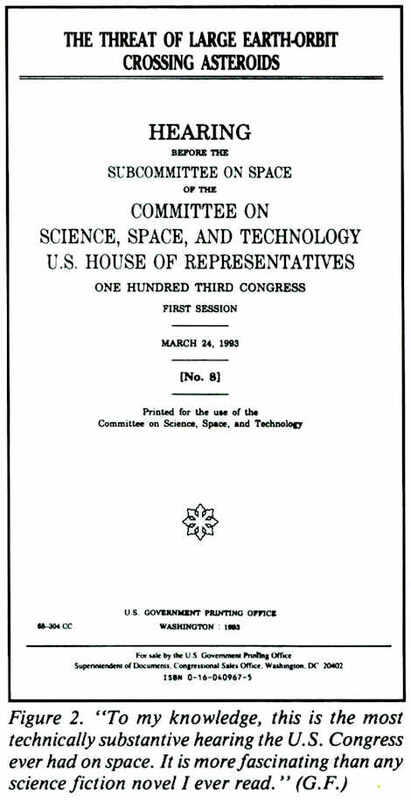 Congress directed NASA to conduct workshops on NEO detection and interception (Figures 2 and 3). Debates are ongoing and the NEO threat issue has gone international. Before conclusions and plans were finalized, interest peaked again due to the Shoemaker-Levy 9 bombardment of Jupiter this past July. At the very least, a determined effort to accelerate the discovery of new asteroids will result, with greater understanding of the resources available to us in near-Earth space (Figure 4). The fundamental philosophy of The High Frontier encompasses these new data. Space colonies are still a logical step to precede or even replace planetary surface colonies. Exploiting lunar surface material resources and delivering them to orbital destinations are still excellent strategies. 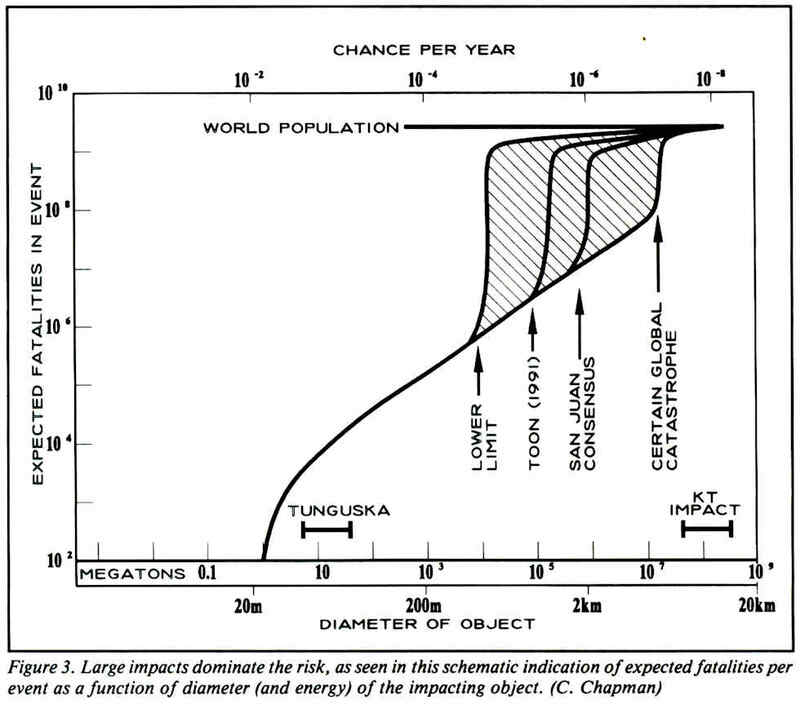 With the introduction of perhaps 2,000 asteroids, 1 km in diameter or more, and tens of thousands of smaller ones, we need to adjust our sights at least twofold: (a) one or more of these objects may represent a cataclysmic threat to Earth; if so, how do we respond? (b) far more likely, all these asteroids represent potential material resources with far smaller delta V requirements than even the lunar surface’s to deliver them to orbital rendezvous. How do we exploit these resources for use in space from Earth, and will the methods be cost-effective? Another dimension of response to our changing world is the degree of inter-organizational cooperation. A decade ago, the higher level of space activity easily supported dozens of diverse space organizations. Today’s more constrained environment causes us to examine more opportunities for collaboration in order to further the objectives, effectiveness and reputations of all of the participating organizations. With increasing knowledge and perspective, we as a community can identify better definitions of productive space missions. The insightful researcher will be sensitive to the “gaps” between the enduring long-term operational needs and today’s technical and systems capabilities. 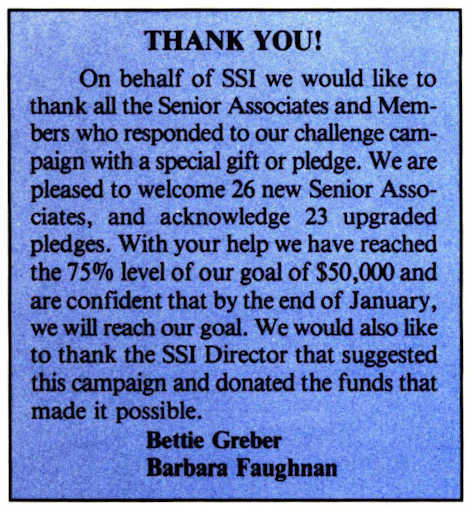 This has been SSI’s legacy, and it should continue to be our strength and focus of respect. Generally speaking, these gaps cover the need to study space missions from a broader systems perspective, and to apply a greater emphasis on increasing the cost effectiveness of all space enterprises through the application of advances, concepts and technologies such as teleoperation and the electronics/communications disciplines. • A Broad Systems Overview of Space Strategy and Missions. What are appropriate measures of effectiveness across all space missions which can help balance priorities between science, exploration, exploitation and protection-of-humanity missions? Can the application of risk management and decision theory provide rational guidelines to suggest the proper balance of investments between manned and unmanned missions, or between NEO detection and a paced program for NEO interception or deflection? • Clarification of the Size and Composition of the Minimum Sustainable and Completely Independent Colony. Many strategies imply that humanity can survive a terrestrial catastrophe through the colonization of space, or that interstellar migration could be accomplished through multigenerational spaceships. How valid are the ecological, physiological, genetic and cultural assumptions supporting these strategies? • Solar Power Satellites. Can revisiting the SPS with deeper, more realistic analyses, assuming the use of space materials from both asteroids and the lunar surface, and optimum man/machine balance improve the case for its acceptability? Can additional studies of terrestrial siting and biological effects of electromagnetic radiation mitigate the risk of beaming power? • NEO Detection, SpaceGuard, Space­Watch. Can additional activity over present plans of employing only passive, angle measuring telescopes enhance humanity’s ability to not only detect all NEOs but to provide rapid and accurate orbit determination? Given that the addition of range and range rate measurement allows a far more rapid and accurate orbit determination, are there practical concepts for low pulse-repetition-rate, perhaps nuclear­ powered extremely long-range radars (a billion km or more)? Would a small, fast mission to place a transponder on an NEO for more accurate tracking, and a prompt prediction of the probability of a hit on Earth, be operational and cost-effective? Would there be practical applications of a Geostar-type navigational grid between Earth, space stations, the planets, the Moon and the NEO swarm? • NEO Interception and Deflection. Is the view of many that the development of an NEO interception system can wait until an actual threatening NEO is discovered a prudent one? Can we completely ignore the alternative of nuclear mechanisms? Would an extrapolation of the mass-driver concept be a practical deflection mechanism? Do there exist deflection system approaches-such as Super Orion, brilliant mountains, and tethering – which deserve at least preliminary conceptual design effort? 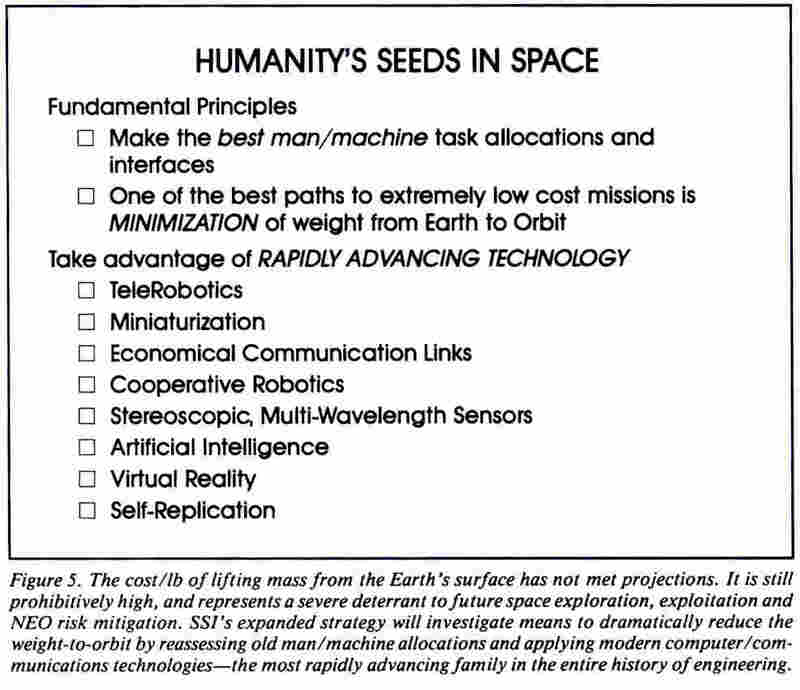 • Humanity’s “Seeds in Space.” Since the cost per pound to lift mass from the Earth’s surface to orbit is not decreasing in accordance with prior projections, a more robust path to economical missions is to employ the almost miraculous advances in the computer and electronics family of technologies to reassess the previous balance of man/machine tasking (Figure 5). If a teleoperated robot can now do the missions which were previously assigned to humans, then an order of magnitude of weight is saved. Additional weight savings can be accomplished by applying the remarkable progress in miniaturization of digital components and mechanical structures (nanotechnology). Improved presence can be obtained for the remote operator through the use of stereoscopic, multi-wavelength sensors, augmented by “virtual reality” techniques. When the increased distances create control system difficulty due to long time lags in the data link, then artificial intelligence tec4uiques can help the delegation of short time response functions to the remote robot while the human still controls the strategic, policy and judgment aspects of the mission operations. Finally – and perhaps the greatest weight savings of all – when more robots of the same type are required, most of their mass can be self­-replicated in space rather than be delivered from Earth. Thus the biological analogy is not too far fetched. Rather than sending entire organisms – or systems – into space, fighting against Earth’s gravity well, we need merely the very low mass “information seeds” under the control of remote operators on Earth. Let me emphasize that this concept does not substantially alter our long-term goal of space colonization. It simply makes its attainment far more economical, and therefore more practical. • Oceans of Energy. 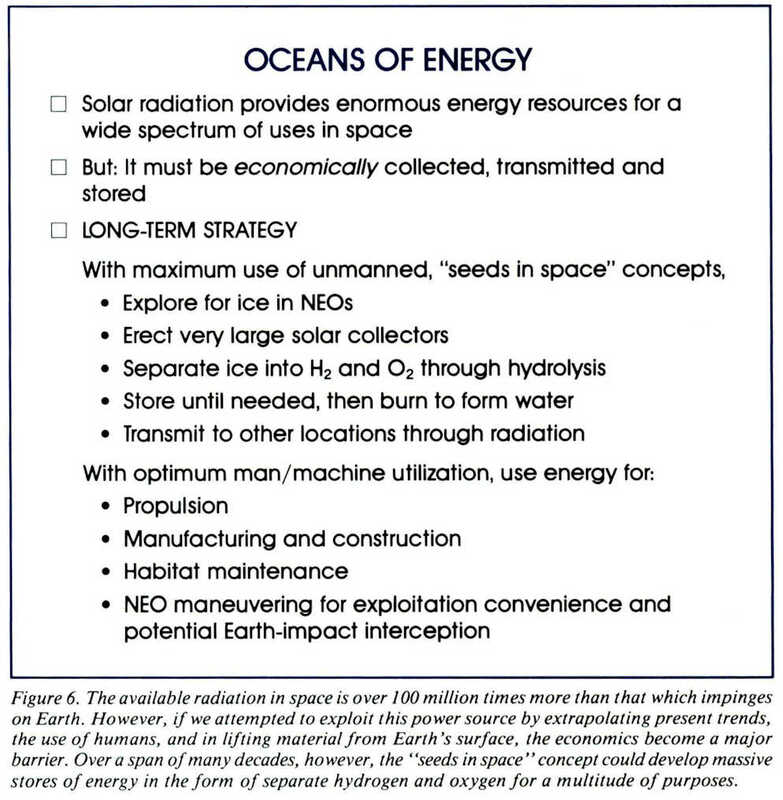 A very long-term strategy is to use the virtually unlimited solar power in space to separate the trillions of tons of ice we’re sure to find on NEOs into hydrogen and oxygen which can be used for a multitude of purposes including propulsion, NEO deflection, materials processing, manufacturing, habitat construction and life support (Figure 6, page 4). Perhaps hundreds of “energy stations” can be placed randomly in high-Earth orbit, each with enormous stores of hydrogen and oxygen. If an NEO with a high hit probability is detected and tracked, then the energy can be employed first to effect the most rapid rendezvous with the incoming object, and then to use all its remaining energy to deflect its orbit. The optimum placement and subsequent emergency deployment of these stations would be a most interesting problem in operations analysis. This concept could conceivably avoid the use of nuclear energy for deflection given that fate is kind enough to permit us sufficient time to implement it. Today’s uncertain environment contains opportunity as well as challenge. SSI’s basic vision is still valid, and we can adapt to seize these opportunities. One adaptation will be to increase our perspective to include NEOs as both potential material sources as well as a possible threat to life on Earth. Another adap­tation will be to seek out beneficial collaborations with other organizations that share our goals. Despite temporary setbacks, space is still humanity’s long-term frontier, and SSI can play a significant role in defining its strategy and substance. The High Frontier Conference XII is sponsored by the Space Studies Institute and will be held at Princeton University on May 4 to 7, 1995. Chaired by John S. Lewis of the University of Arizona, this conference provides the opportunity to bring together large numbers of space researchers representing a range of diverse backgrounds and interests. The High Frontier Conference is a biennial forum for the exchange of information about the advances in space technologies, programs and concepts. The conference will attract engineers, researchers, architects, builders, educators, lawyers, economists, sociologists and others interested in the development and settlement of space. 1. The information should be new, or the paper should be a significant synthesis of existing information. 2. The abstracts should describe how much of the work has been completed and how much will be accomplished by the final submission. All presenters must prepare an abstract for their presentation. 1. The abstract should be between 300 and 600 words, on 8.5 x 11 paper. One additional page of graphics may be submitted for review. 2. Please submit: two (2) copies of the abstract including names, affiliations, addresses and phone numbers of all authors. 3. Submit abstracts to: by US mail: Space Studies Institute P.O. Box 82 Princeton, NJ 08542. By FedEx: Space Studies Institute 5 Crescent Avenue Rocky Hill, NJ 08553. Final Papers AIAA publication guidelines must be followed for all papers. Camera-ready copy must be received by April 17, 1995. Papers not received by that date may not be presented at the conference, and may not appear in the proceedings. Abstracts will be accepted from anyone who has special knowledge of, or interest in, the space manufacturing, exploration and development fields. A registration fee of $340 includes lunches, coffee breaks, the Saturday night banquet, Sunday afternoon picnic, a hard-bound copy of the proceedings and admission to all sessions. For early registration (before April 15), the fee is $325. Call the Space Studies Institute to receive a registration packet. 609-520-1200. It is located approximately three miles north of Princeton. $70 per night includes breakfast and van service to the conference site. The Palmer Inn, Rt. 1, Princeton, NJ, 800-688-0500. It is located two miles south of Princeton on Rt. 1. $62 per night includes breakfast and van service to the conference site. The Nassau Inn, Palmer Square, Princeton, NJ, is located in town and within walking distance of the conference site. A rate of $99 per night is available. 609-921-7500. To receive these special rates, please be sure to mention that you are attending the SSI Conference when making your reservation. The nearest airport is Newark International Airport, approximately 45 minutes by car north of the conference site. Transportation via van from Newark Airport to the hotels is available by the Princeton Airporter Service. Limousine service to and from the airport is through A-1 Limousine. Train service in the area is provided by Amtrak or New Jersey Transit to Princeton Junction, with a connecting shuttle train to Princeton. SSI’s goals include using the material wealth and solar energy of space to improve the human condition both for those who live on Earth and those who live in space, and to build Earth-like habitats in space to expand the ecological range of humanity throughout the solar system and ultimately, perhaps, through­out the galaxy. SSI’s Corporate Membership program offers access to SSI’s broad base of technical advisors, access to a resume pool, and access to exhibit space at the biennial SSI Conference on Space Manufacturing. Research partnerships are encouraged. The Senior Associates Program is currently SSI’s largest source of funds for High Frontier research and education. The program also provides a way for anyone interested in the High Frontier to play a key role in making space colonization and space manufacturing achievable within our lifetimes. SSI Membership is open to individuals worldwide. All members receive the Institute’s newsletter, which is published bimonthly and keeps all SSI members abreast of SSI research, an SSI membership card and decal. Member­ship fee: Regular $25.00; Senior Citizen or Student $15.00; non-US addresses, please add $10.00. NEXT: 1995 April May June with 3 O’Neill Core reminder articles, SSI’s Dr. Leik Myrabo and Yuri Raizer’s Aviation Week and Space Technology article on SSI’s Air Spike project. A FULL quarterly issue.